Bowflex Adjustable Dumbbells 552 Review - With Video! There are 5 or 6 excellent pairs of adjustable dumbbells on the market, the Ironmaster pair, Powerblocks and Cores twist locks to name a few, but what is that make the Bowflex adjustable dumbbells the most popular dumbbell pair on the market today? Reputation! yes, reputation will go a long way to selling any product and if you have the history of the likes of Bowflex who are very well known for their high-grade fitness equipment, you already have a lead over the struggling competitors. But reputation alone will not make a dumbbell set as successful as the Bowflex series, Bowflex brought something new to the adjustable dumbbell market, they designed an adjustment system you could quickly change with a twist of your wrist. No longer do you have to remove and add weight plates to your dumbbell handle which took up valuable time between sets. Bowflex’s dumbbells now included their dial a weight adjustment system. A time-saving system that takes just a few seconds to select the desired weight of your choice. Another brilliant feature of this highly adjustable pair is their ability to replace up to 16 pairs of standard fixed weight dumbells. Bowflex 552 with 5 -52lb weight range not only reduces the space needed to store your dumbbells it also lowers the price compared with having to buy a set of fixed weight dumbbells. They may be the best selling adjustable dumbbells but are they the best? I’ll cover just about all you need to know about the Bowflex 552 dumbbells in this review: weight range, adjustability, build quality, pros & cons and a video to give you a really good look at the dumbbells. I think it’s worth a mention that the 552’s are probably not best suited for pro bodybuilders or serious strength training. A 52lb weight range is geared more towards the larger beginners to intermediate market or fitness fanatics looking for an adjustable pair to add resistance training to their fitness routines. That’s not to say you can’t build some serious muscle with a weight range of 5-52lb, and it’s possible some beginners may never outgrow the weight range. It’s just worth noting, for some popular exercises like bench press and military press as your strength increases 52lb per dumbbell just might not be enough. The design of the Bowflex will not allow for extra weights to be added, there are no expansion packs available like you have with the Power Block or Ironmaster pairs. This is something to always keep in mind, try and think ahead what are you training for, strength, bodybuilding, endurance training? As you do not want to be left in a year or two having to pay out for an extra set of dumbbells for heavy workouts. If you love the quality of Bowflex and the select dial system, extreme and more serious lifters would certainly want to take a look at the Bowflex 1070 pair, they have a higher weight range, up to 90lb per dumbbell. If I sound like I’m talking this pair down I’m not, all I’m saying is, it’s a good idea to think ahead, and for most people, the weight range of the Bowflex 552 should be sufficient, especially if you perform the exercises with correct form. The patented select tech dial a weight adjustment system is arguably the best feature of this dumbbell pair, and I’m sure it’s what sells 1000’s of these fantastic dumbbells every month and so it should do. It’s fast and hassle-free and almost foolproof. The adjustment system will speed up times between sets, great for super sets, drop sets and CrossFit, slightly faster than the Powerblocks and I’d almost say twice as fast as the Ironmaster to adjust, making Bowflex No.1 for speedy adjustment times. So how does this adjustable system work? Nice and simply thankfully, there’s a numbered dial at each end of the dumbbell that you twist to select one of the 15 different weight amounts. The weight plates then attach to the handle using little brackets inside each handle. By turning the handle the brackets select and grab the weight selected, leaving the unselected weight plates behind in the specially made holding cradle. It’s that simple. What’s nice about this system is you have the option to decide how much weight to select on each side of the dumbbell, It can be handy sometimes to use offset weight configurations with dumbbells for exercises such as farmers walk, hammer curls, lunges etc, although for most offset weight training I’d recommend using a barbell, less stress on your joints. When you hear the name Bowflex you immediately think of a premium brand and a price tag to match! And yes both are true of their dumbbells sets. Premium quality at a price. Their reputation is built on providing guys and gals at home with some of the best fitness products on the market and their dumbbells are no exception. What they have managed to do here is design and build a dumbbell set that’s super fast to adjust and tried incredibly hard to make it as durable as possible. A well designed ergonomic handle ensures the thicker part of the handle is in the middle of your palms giving you a comfortable grip, it’s nice to see the handle also has slight ridges in the grip helping with any slippage issues. I had a good read of the Amazon reviews for you, and to be honest, I was surprised just how positive all of the reviews were, with 94% giving the Bowflex pair 4-5 start review ratings, that’s quite impressive considering the number of reviews, nearly 4000! A very reassuring stat for you if the Bowflex are at the top of your wish list. 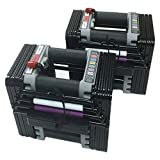 Great build quality is normally coupled with a long warranty, Bowflex offers a 2-year warranty, Powerblock a 10-year and Ironmaster a lifetime, they are the top 3 adjustable dumbbells at this price point. So why are Bowflex only offering the 2-year warranty? My thinking on this would have to be the design of the adjustment mechanism and the fact the weights plates are covered in a hard plastic. Dumbbells, because of their environment, tend to have a rough life, stick plastic into the equation and you could hit a few problems. Dropping a dumbbell by either training to failure or by accident is commonplace in most gyms but most gyms use fixed weight dumbbells which are very hard to damage, adjustable dumbbells have moving parts and some of those parts are plastic and I’m afraid if dropped from a height will break. First to break will probably be the handle and then the hard plastic surrounding the weight plates. It’s not all bad, you can try and be very careful when training with sets like the Bowflex and it’s also great to know Bowflex listened to the customers and replaced an important part in the new sets. The Bowflex dumbbells now have metal tabs that secure the weight plates in place, before this the early sets used to have plastic tabs and many customers were complaining of breakage only after a few days. Thankfully Bowflex listened and changed to metal, making this set much more durable, this doesn’t mean you can throw them around but it certainly makes the pair a lot less delicate. There is one other issue with the Bowflex dumbbells and it was my main concern for the dumbbell pair, they have the longest handles out of all the dumbbells I have reviewed, and long handles can mean awkwardness. The reason the handles are long is that they go through the entire set of weight plates, the handle is a fixed length so no matter how much weight you select the handle length will stay the same. Unlike the compact design of other adjustable dumbbells where the handle increases with length only when extra weight is added. It can be troublesome using longer handles especially when curling with the handle, they can hit the hips and also tend to clash with overhead pressing but it’s something you can get used too, most people seem to be fine with the handle length after a few weeks, it’s a not a deal breaker. Summary Designed for speed and replacing the need for 16 sets of fixed dumbbells, the Bowflex 552 are a versatile well built set of adjustable dumbbells. The select- tech dial system is an impressive design and makes the Bowflex stand out from the rest. More seasoned weightlifters maybe want to check out Bowflex's 1090's, but for beginners and the intermediate, the 552's are a fantastic addition to any home gym. NextDetailed Review of The Stairmaster Dumbbells – With Video! I am a fan of the powerblock dumbbells myself but you have definitely opened my eyes the bowflexes. I don’t like the fact there may be broken pieces off the bowflex. It also looks like adjusting the weights takes a little effort and I can see how they can get stuck if not set correctly. It would be so nice if the warranty was a bit better on these. If you had to choose, would you go with Bowflex or Powerblock? And why? Personally, I’d go with the Powerblocks because you can buy the expansion packs. The Bowflex are a great set of dumbbells but you are limited to the 5-52.5lb weight range. The stacking system of the Powerblocks also allows for a more compact dumbbell whereas the Bowflex have the long handles making them a little more awkward to train with, nothing you can’t get used to but a compact dumbbell will always feel that little more natural to train with than the fixed length handles of dumbbells like the Bowflex.